Traveling? Camping? Backpacking? You're sitting in a restaurant in a foreign country. That glass of water in front of you — is it safe to drink? You take out your SteriPEN Aqua and, ZAP!, clean, safe water to quench your thirst. SteriPEN Purifiers are the smallest, lightest and easiest to use purifiers on the market. They are fast, small and can destroy over 99.9% of all waterborne bacteria, microbes and viruses including E-Coli, Giardia, Crypto, Cholera, Hepatitis, Influenza, Salmonella, and dozens more! 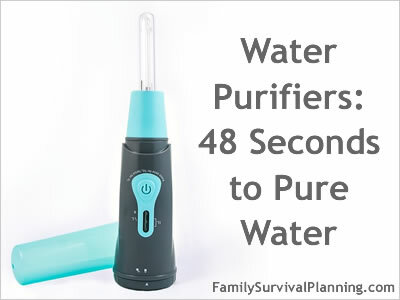 The 48 Second, SUPER COMPACT, Portable Water Purifier! The SteriPEN has changed the way we think about creating clean, drinkable water. They sterilize like most hospitals do - ZAP the water with ultraviolet light to kill bacteria and viruses. No filters! No chemicals needed! The SteriPen purifiers are handheld and portable, eliminating both weight and bulk. The SteriPen ensures safe drinking water with a disinfectant system that is better than any chemicals. The SteriPEN Aqua will purify 3,000 treatments of water; the SteriPEN Ultra purifies 8,000 treatments — all at a cost of about 9¢ per gallon over the life of the UV bulb. Bottled Water .99 - $9.00 per gal. It is designed to destroy the DNA of waterborne microbes, rendering them harmless as well as kill 99.9% of all viruses, bacteria, protozoa, household germs and bio-terror weapons like botulism, cholera, smallpox, and typhoid. It's also eliminates travel risks that can cause diarrhea, dysentery, hepatitis and Legionnaires' disease. Simply press a button, place the lamp end in water (failsafe safety switch will not allow lamp to go on unless it is immersed in the water). SteriPen's liquid level sensors indicate that the UV lamp is fully in the water at which time the microcomputer activates the lamp for the dose period. After less than a 90 seconds of gentle stirring the treated water is disinfected and ready to drink. Pressing the Start button once treats 32 ounces of water or twice to treat 16 ounces (48 sec). I know, it sounds a little backwards but it's actually a built-in safety so as to never under-treat your water. Should you prematurely take the lamp out of the water, the purifier will warn you with a red light that the water is not ready to drink. Watertight seal keeps water away from the internal electronics. It doesn't get any easier or simpler than this to ensure FAST, safe drinking water. The SteriPen purifiers are the only water purifiers that use PROVEN germicidal UV (ultraviolet) Light Technology that requires NO CHEMICALS or Pumping. I have found SteriPENs at REI, Emergency Essentials, and Amazon. Amazon has several types, each with unique characteristics.